Pensacola State College received nearly $40,000 on Wednesday to help students pay for the cost of higher education. A majority of the scholarship dollars ─ $27,220 ─ were donated by Florida Blue, the Helios Education First Generation Scholars program and Bank of America’s Dream Makers First Generation Scholars program. Local supporters also chipped in over $12,000 in matching funds to bring the donation total to $39,980. 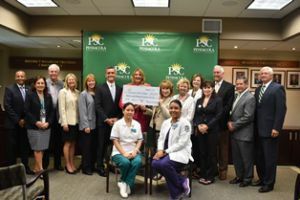 Florida College System Chancellor Madeline Pumariega and FCS President Judy Green presented an oversized $27,220 check to Pensacola State President Ed Meadows during a ceremony. Each year, the FCS Foundation distributes hundreds of thousands of dollars to Florida’s 28 state colleges to provide scholarships to students. Florida Blue donated $12,760; the Helios Education Foundation contributed $8,979; with Bank of America giving $5,481. Two scholarship recipients – Wei Anderson and Jessica Helloms-Poindexter – were on hand for the presentation. Anderson, who is enrolled in the RN program, described the scholarship as a blessing. “College tuition is very expensive but Pensacola State is helping me achieve my goals,” said Anderson who plans to eventually become a certified registered nurse anesthetist. Helloms-Poindexter added the scholarship funds will help alleviate the stress of nursing school. “Nursing school in itself is stressful, but not having to worry about tuition is such a relief,” said the Pensacola native who always dreamed of becoming a nurse. As a teenager, she was enrolled in the Academy of Healthcare Professions while a Pensacola High student. Today, she works in Sacred Heart Hospital’s oncology department. During 2017-18 academic year, 82 Pensacola State students received scholarships from $42,339 donated by Florida Blue, the Helios Education Foundation, Bank of America and private donors. Eleven students were awarded scholarships from $7,779 donated by the Helios Education Foundation. Forty-nine students received funding from a $24,827 Florida Blue donation. And 22 students were assisted by $9,733 from Bank of America’s Dream Makers First Generation Scholars program. Florida College System Chancellor Madeline Pumariega and Florida College System Foundation President Judy Green presented $27,220 in scholarship funds to Pensacola State College President Ed Meadows on Wednesday afternoon. The funds were matched by donations from local supporters to bring the total in scholarship funds to $39,980. The Florida College System funds were donated by Florida Blue, the Helios Education Foundation and Bank of America’s Dream Makers Program.